I found a recipe for these recently and have been itching to try them. Do you even know what is in a box of these things? I'm tellin' you...crackers are easy-peasy! Combine all ingredients in a a food processor, pulsing till crumbly. Slowly add the water, 1 TBL at a time, pulsing after each addition. When dough comes together, STOP. Remove dough from processor and form into a disk. Cover with plastic wrap and refrigerate for about 1 hour. I rolled my dough between my 2 silpat mats. You could use parchment paper, but I have not had very good luck with baking crackers on parchment. Roll out evenly to fit a 13X18 baking sheet. Score with a pizza cutter or sharp knife (carefully if you are using a silpat!) into small squares. At this point you may sprinkle with kosher salt. I did not, as I thought the cheese was salty enough. Bake for 25 min. or until crackers are evenly brown. I check mine every few minutes, removing the outer ones as they brown quickly. These are SO dang good, you will not want to stop eating them. 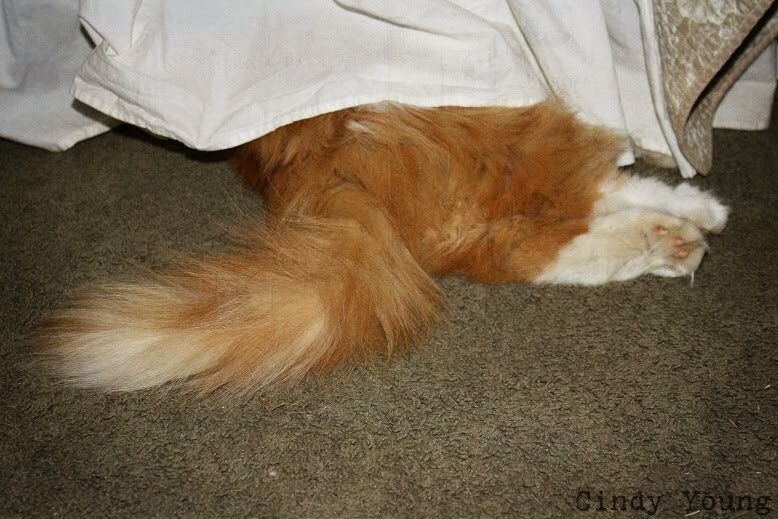 Who does he think he is hiding from???? Anything new coming out of your kitchen lately? OK, YUM! Another 12 days to go before I'm supposed to eat grains. Sigh. Did you see there is going to be gardening classes at Trillium this year? Woo hoo. Can't wait to try these! They look yummy! Cyn, these sound so good! Im going to try them...My husband and I are in the process of trying to get most of our foodif not all switched over to whole, raw and/or real foods...this is not an easy transition and there is so much to learn. Im ao glad that my hubby is on board with this though or it would never work.....We watched a film called Food Matters and it reall got us thinking....we have been making changes over the past few years but now we are geting more aggressive with it. Hope to try a batch this weekend, maybe with some goats milk cheese. Wow! We do our baking using Prairie Gold, and I can't wait to try these. My hubby and children are going to LOVE them, and I'm afraid I will too:) Blessings! I have some kids here that would LOVE these...guess I will make them too. :) Thank you for sharing!!! Wow! Just found your blog through Homestead Revival! I've been wanting to try making crackers, and this sounds perfect. My kids and husband love Cheez-its! Can't wait to try this recipe out! Oh my, yum! Hubby would LOVE these- bookmarking this for sure. Thanks for sharing this, I have never seen homemade Cheezits anywhere else! I love crackers! I will definitely have to make these crackers. Oh, wow! Those look fantastic and healthy, too. I'm definitely trying these :) Thanks for the birthday wishes! Yes, new things are being made in my kitchen! I'm in there soooo much these days! Tonight was a super duper yummy custard that was scary good. Oh. Dear. Me! 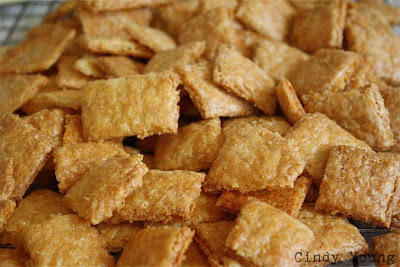 Oh how WONDERFUL to hear from you...First let me say that this Cheez-It Recipe Looks and sounds yummy...I am a Big Cheez-It fan..but don't buy the ones I grew up on..I get the ones from our health food market..However these sound even better and FUN..the children are going to love giving this a try.. I love Cheese-its! Haven't had them in years - and these look much better, anyway. Love your cat! Does he eat rabbits? Can I borrow him? I just made these and have a feeling there won't any left by morning! They really are delicious. I just recently tried cracker recipes from Mary Janes Farm Magazine, they really afre easy and delicious. I can't wait to try this one! I love making crackers and these look wonderful; will make this week and let you know how long they last -smile-. Just popped over to poke you in the side to say Hi! Only to find exactly how talented you are. Cheez It crackers! How do you do it? I can't have diary (except goat) anymore, but yours look yummy. Really, how do you do this. You have your hands in so many pots and they all come out beautiful. The Lord has blessed you. Good to pop in and say Hi. Have a blessed Easter.